If you ever have to travel on Awolowo Road, in Ikoyi, Lagos during a period of fuel scarcity, you will understand how much of a mad house it can be. The traffic literally stands still, carrying a trident and waving its two horns flipping from side to side. Traffic on those days can be the devil. 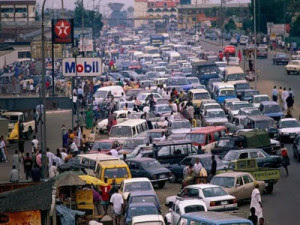 It’s not only Ikoyi, virtually every fuel station in the city will be invaded by mammoth crowds and mile long queues. It’s always a commuter’s night mare, take my word for it. This is why the Lagos State Traffic Management Authority (LASTMA) has decided to take strong measures in curtailing the effect of fuel queues in Lagos State and what better way to do it than introducing a stiff fine. It’s no one’s problem that you are already frustrated and vexed from the physical exercise it takes to buy fuel, after having to shove everyone else back and forth just so you can have your meeting with the fuel pump. Or that your car and home generator tanks are empty while PHCN seems to still be on strike. No, all those instances of frustrating moments don’t matter because it’s after all this that LASTMA will come and tow your car. Phew, I don’t want to be in the position of the motorists when LASTMA comes to jam him or her after being on a fuel queue for hours. Neither do I envy the LASTMA official who will be walking on dangerous grounds and may likely bear the brunt of such a motorist’s fury. I am sure @AmbodeObsarver will have a lot to report to his unofficial official boss.